Indians use the Internet for a host of applications, and some of these uses are culture-specific, like formalized matrimonial searches. This chapter examines the growth of matrimonial websites in India and explicates how Indians have adopted new Web technologies to preserve the traditional hegemony of arranged marriages. This technology has helped older generations of Indians become a part of the Web revolution and has allowed newer generations to adhere to traditional cultural norms on more progressive terms. Some specific items reviewed in relation to this development are the adaptation of arranged marriages to new technology, the growth of matrimonial websites, the success of such sites in niche groups, and the impact of these sites on Indian cultural norms. The proliferation of the Internet has been meteoric even by conservative standards. Several developing nations are taking advantage of new communication technologies to propel themselves into the center of this global revolution. One country that is successfully riding the Internet wave is India. Its adoption of the Internet has been slow but steady, and the number of Internet users in India has grown from less than 2 million users in 1998 to over 80 million users (and growing) today – this factor translates to a whopping 1,500% penetration rate in the last decade (Internet World Stats, 2009). Today, Indians use the Internet for a host of common applications including email and instant messaging, job searches, online banking, shopping etc. They also use the Internet for certain culture-specific applications such as formalized online matrimonial searches (Internet & Mobile Association of India, 2008). Within the cultural context of India, online matrimonial searches are conducted through matrimonial websites that are really a variation of dating sites. The main difference is that these matrimonial websites focus on marriage rather than dating. Users of these sites upload their information, pictures, and partner preferences onto a searchable database maintained by the Website’s owner, and individuals can then search this database via customized criteria like nationality, age, gender, religion, caste, and geographic location. These online “life-partner portals” are the new wave of an age-old Indian tradition of arranged marriages – marriages where alliances are initiated by family members and bound by cultural, social, and ethnic conventions. India has a long and continuing history of traditions, some of which have transcended centuries of cultural evolution; the practice of “arranging” marriages is one such tradition. With the innovation of technology, the spread of globalization, and the breakdown of large joint family systems, Indians are now part of the global village – a world where pizzas, burgers, denim, and rock music are as integral a part of the landscape as they are for Americans, Europeans, and other Asians. Today’s Indians, thus, are in the midst of what can really be described as a homogenization of culture. It should be noted, however, that this “e-technologization” of age-old traditional systems has been more drastic for urban, educated Indians and that a large majority of the Indian population still continues to live a thread-bare existence with irregular access to nutritious food, clean drinking water, electricity, and other basic amenities (Guha, 2007). Despite these disparities, the need to conform to traditional marital practices is a trait that that can be found in most Indian communities. In this chapter, the author examines how new communication technologies have had a profound effect on the culture of arranged marriages. To do so, the author has divided the chapter into five distinct sections. The first section provides a review of the history of arranged marriages in India and is followed by a discussion on the evolution of the matrimonial matchmaker in Indian society. The second section examines the growth of the online matrimonial industry. The purpose of these sections is to introduce the reader to the cultural significance and proliferation of arranged marriages in India and help the reader comprehend the importance of India’s online matrimonial industry. The third section presents a dialectical perspective concerning online matrimonial services. The fourth section, in turn, discusses the popularity of Indian matrimonial websites in niche groups, especially diasporic Indians and the social effects of matrimonial websites. The fifth and final section then examines two different theoretical perspectives in order to explain the adoption of Indian online matrimonial services. Overall, the purpose of the chapter is to provide readers with a thorough understanding of the use of new media technology in preserving the tradition of arranged marriages in India. The chapter also offers various theoretical explanations for the effects of technology on culture and society. On a more abstract level, the chapter will allow readers to comprehend the dialectical relationship of social and technological determinism – the twin arguments of whether humans shape technology or are shaped by it. 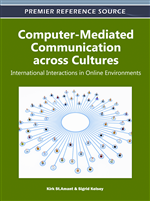 By exploring this facet of cyberspace, individuals can gain a deeper understanding of cultural processes at work and the role of technology in maintaining cultural norms.